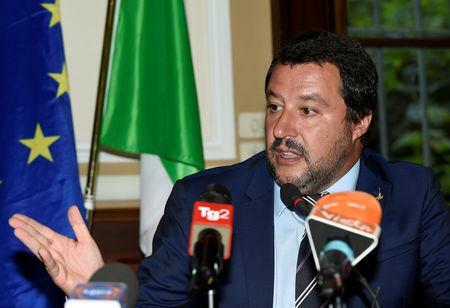 VIENNA/ROME (Reuters) - Italian far-right leader and Deputy Prime Minister Matteo Salvini likened African immigrants to slaves at a European conference on Thursday, drawing an angry response from Luxembourg's foreign minister, who cursed at him in frustration. Salvini, who heads the League party, has led a popular crackdown against immigration since Italy's coalition government took office in June. He was speaking at a closed-door session of a conference on migration and security hosted by Austria, which holds the rotating European Union presidency. "I heard someone say we need immigration because the population is ageing. I see things completely differently," Salvini told the session in remarks filmed and posted on his Facebook profile. "I'm paid by citizens to help our young people start having children again the way they did a few years ago, and not to uproot the best of the African youth to replace Europeans who are not having children anymore... Maybe in Luxembourg there's this need, in Italy there's the need to help our kids have kids, not to have new slaves to replace the children we're not having." Jean Asselborn, Luxembourg's foreign and immigration minister, was sitting a few places down from Salvini and grew visibly angry as Salvini spoke, finally interrupting the Italian in French with "Allez, allez, allez", suggesting he had gone too far. "In Luxembourg we had tens of Italian immigrants. They came as migrants, who worked in Luxembourg so that you could in Italy had money to pay for your children," he said in French, concluding with the exclamation "Merde alors!". Asselborn was apparently referring to the decades following World War Two, when several European countries took in migrant workers to meet the demand for labour during a prolonged economic boom. The conference, which includes some European and African interior ministers as well as EU officials, was due to wind up on Friday afternoon. Salvini was also due to hold a joint news conference with Austrian far-right leader and Vice Chancellor Heinz-Christian Strache at 4:15 p.m. (1445 GMT) on Friday.